Mina – sandy bay which is about 500m from the center of Jelsa. Ideal for children. Grebišće – sandy beach bay about 1.5 km away from Jelsa. It consists of 2 bays “Velo Grebišće” and Malo Grebisce”. 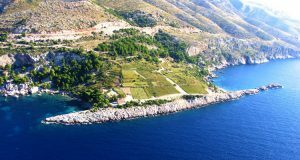 It is situated near Hvar town, 2.5 km to the east. 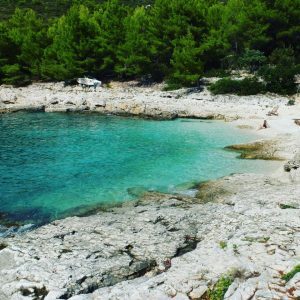 It consist of 2 pebble beaches and white stone shore (“Bilo punta”), ideal for those who want to feel all the strength of Hvar sun. There is an restaurant in the bay. You can get there walking or by boat. The small village and bay Milna is 4 km east from Hvar town. There are 2 pebble beaches and pitoresque pine forest with agava trees and vineyards. Along the bay there are two other bays also with pine forests – “Malo Borce” and “Veliko Borce”. Milna is one of the oldest excursion getaways of Hvar town, established since the beggining of tourism in Hvar. Its relaxed rural nature is confirmed by old mansion from 17 century, built by the old noble Hvar family Ivanid. There are several restaurants in Milna. 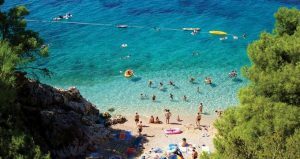 There is an organised transfer by boats from Hvar harbour, and it is also possible to come by car or by foot. 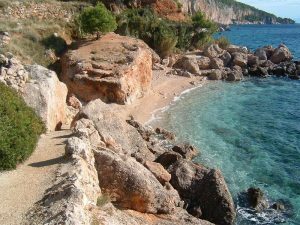 Under the old abandoned village of Zarace, situated on the top of the stone rock (from the sea looking like a pirate nest), there is a deep bay with large pebble beach. For the lovers of underwater sea life there are very interesting pictoresque areas in this part of Hvar. There are several restaurant here. You can get here by car or boat. 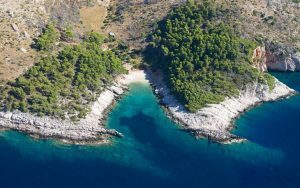 The favorite Hvars ecxursion spot situated 8 km eastern form Hvar town, with a large pebble beach and wonderful underwater areas. Like a Milna, Dubovica also has a long “getaway” tradition. There is a restaurant there, and you can come by car or by boat. The excursion place 8km east from city of Hvar, with a pebble beach and thick pine forest. Also there is a restaurant here. There are daily excursion trips organised from Hvar harbour. 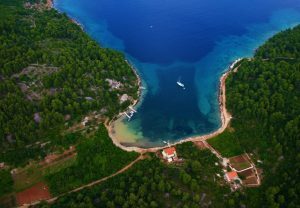 The settlement and excursion spot is 12 km away from Hvar to the east, it is best to come here by car. There are nice beaches along the shore as well as restaurants and pensions. Somewhat more detached excursion area (13 km from Hvar to the east). There are several restaurant and pensions. It is possible to come here by car. 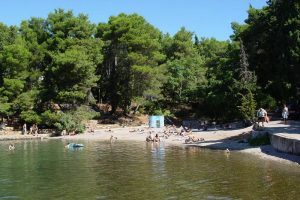 The beach Banj, pebble beach situated on the north side of the Stari Grad bay, it is apropriate for small children and also good for disabled persons. There are restaurant, and you can rent beach cheers. 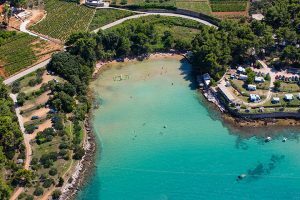 The bay Maslinica, is situated 2 km from the center near the Stari Grad ferry harbour. 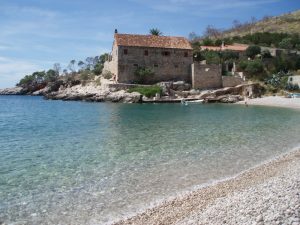 It is the only sand beach in the Stari Grad bay area where you can come by car. There is a parking lost near bye. 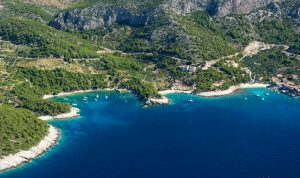 In the rest of the smaller bays of the Stari Grad bay area you can come by driving a car along the peninsula Kabal, or by boat that you can rent in several renta boat agencies in Stari Grad, or by taxi boat which will transfer you to the bay of your choice.